They say that two wrongs don’t make a right. And as it turns out, two rights don’t always make a right either. Each part of her post is technically correct, with a few qualifications. Hmmm … which one did Paul really mean? Did he mean just our thoughts, all of our mental faculties, or specifically to the perception of the divine? Dr Leaf never really says, although there’s a big difference between perceiving and understanding in general, and the specific capacity for spiritual truth. 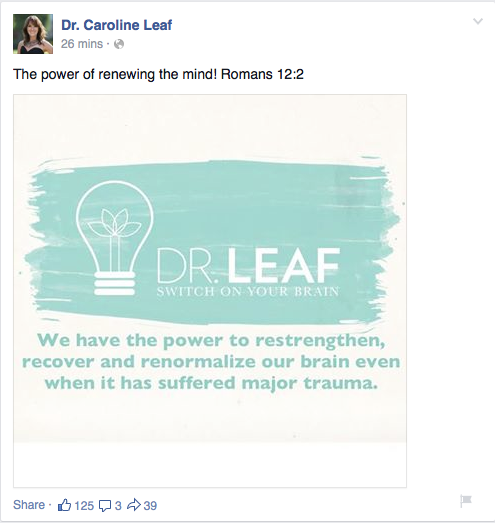 So Dr Leaf’s interpretation of Romans 12:2 might be correct, depending. The other half of her post is also true, but in the most vague sense. “We have the power to restrengthen, recover, and renormalize our brain even when it has suffered major trauma” is technically true … the brain can recover from significant trauma. It does this through neuroplasticity, broadly defined as “the ability of the nervous system to modify its structural and functional organization.” (http://emedicine.medscape.com/article/324386-overview#aw2aab6b4) Neuroplasticity is a property inherent to the nervous system of every animal that has a nervous system; humans are not unique in this regard. Given the massive scale of the human nervous system (0.15 quadrillion, or 150,000,000,000,000 synapses throughout the average brain ), then there is massive scope for neuroplasticity-mediated regeneration, though it’s not unlimited. Neuroscience is only just starting to unlock the incredible depth of the science of our neural synapses , the foundation of neuroplasticity. However, just because her two statements are separately correct in some vague sense, does not make the combination of the two more correct. If anything, combining them results in a non-sequitur type of false argument – the two separate statements don’t support each other in a logical way. A bit like saying, “My cat has four legs. A cow has four legs, therefore a cow is a cat”. Our ability to “restrengthen, recover, and renormalize our brain” is a capacity built into our nervous system that has nothing to do with “renewing our minds” in the scriptural sense. They only seem similar in the fuzziest of ways because they share a single common element, but otherwise, they really aren’t the same process. Dr Leaf may appear to be unlocking the hidden mysteries of scripture and science, but just because her statements are vaguely true or vaguely similar doesn’t mean they explain anything … something to be aware of when reviewing Dr Leaf’s teaching. Sukel, K. The Synapse – A Primer. 2013 [cited 2013, 28/06/2013]; Available from: http://www.dana.org/media/detail.aspx?id=31294.